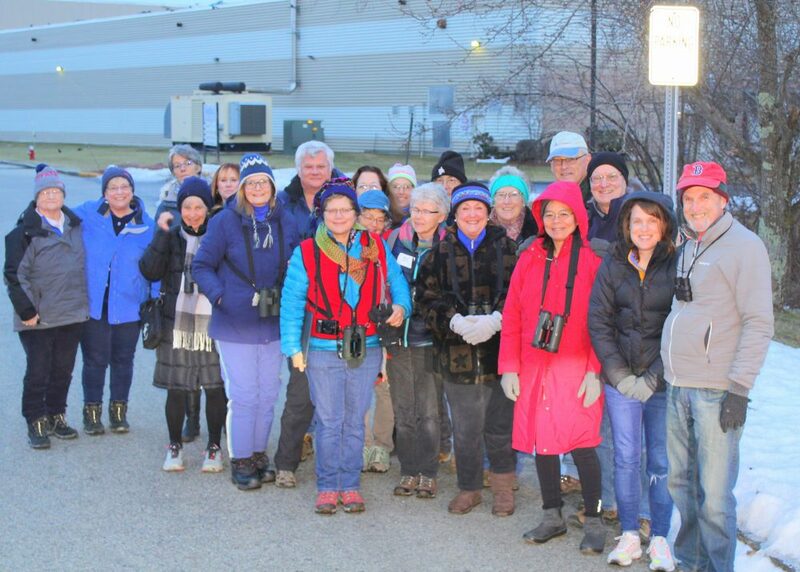 Crow Patrol was in full force Sunday night with a group from Mass Audubon Society out to see the Crows; sunset time was 4:51PM; mostly cloudy skies, wind S 10MPH, gusts to 21MPH, 42F windchill 36F. 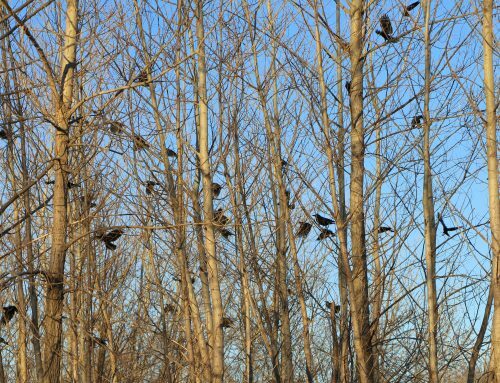 Made initial survey of staging areas, with 4 others, just west of Eaton St. and the Boathouse; lots of staging Crows seen along entire stretch of Andover St. including in areas around Industrial Way and Bulfinch Drive. 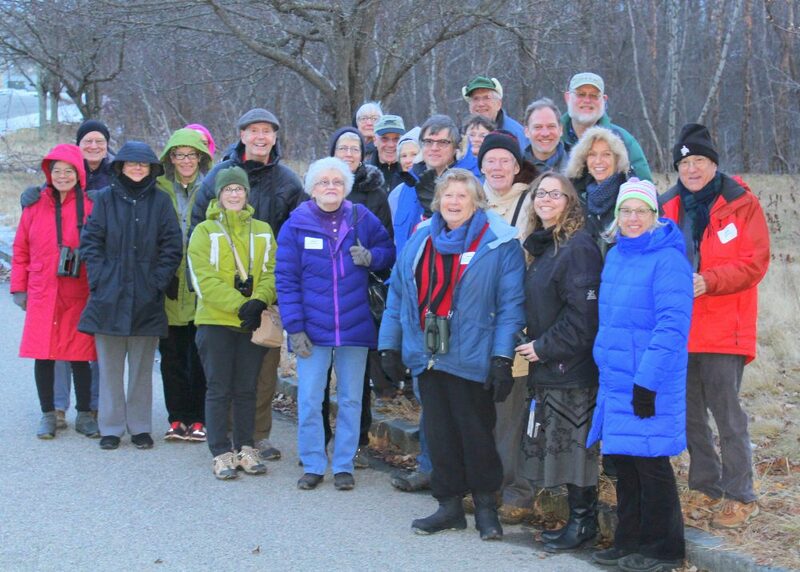 We were joined by a lively and energetic group of friends from the Mass Audubon Society. 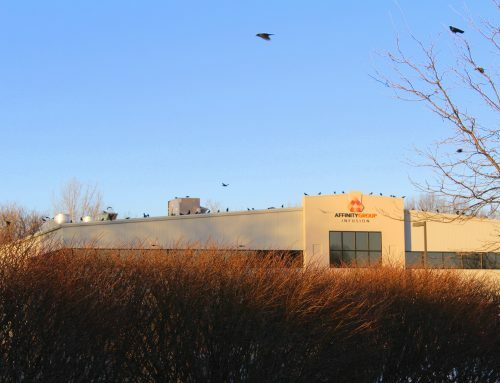 Together in two large caravan time was spent scouting out staging locations along the extended Industrial Way of buildings with a high concentration of American And Fish Crows seen around and on top of the New balance distribution facility and atop the gem group building. We paused for a few group photos! Around 4:40, the Crows were making a move in NE direction, so we relocated to the Bashara Boathouse at end of Eaton St. A much larger group joined us as we observed the Crows streaming in from downriver and they began staging in trees just to our west along the south side of the Merrimack River. The clouds and sky provided a delightful mix of colors to the great delight of all despite the cold and the wind off the water. 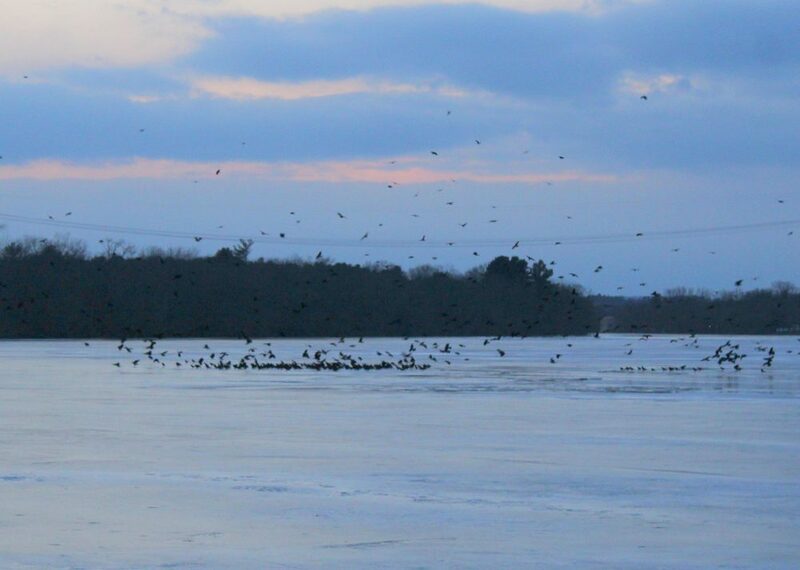 The dramatic increase in the number of Crows on the ice was quite a spectacle to watch. 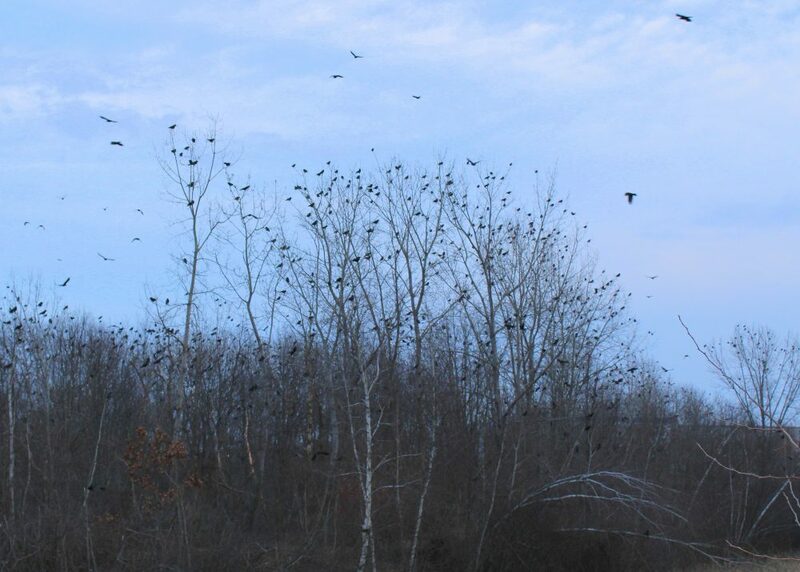 The initial group was fifty then a couple of hundred; it quickly multiplied into the thousands as the skies darkened and more Crows arrived! 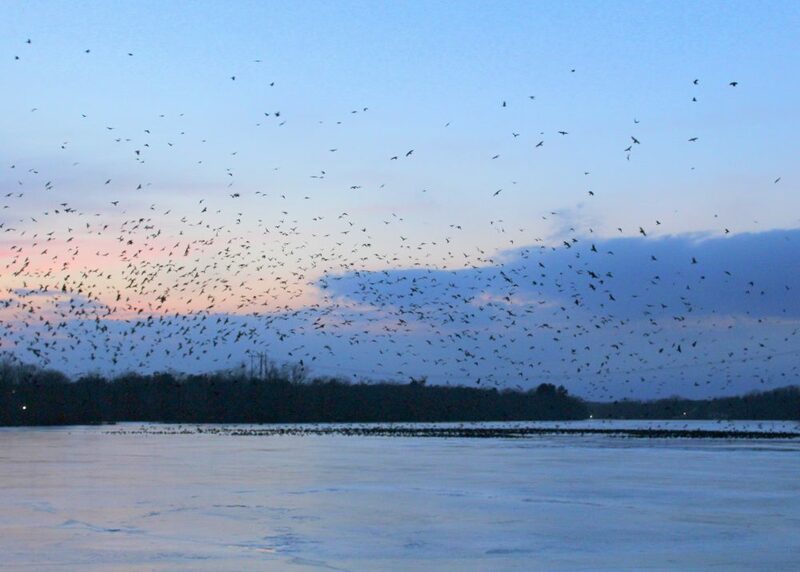 About 5:25, after 10 minutes of watching smaller streams of Crows lifting up and moving downriver towards the Dam, we departed and relocated to Riverfront State Park to join others, and to watch the much larger and growing group of Crows assemble on the ice between Riverfront and the Great Stone Dam/Rt. 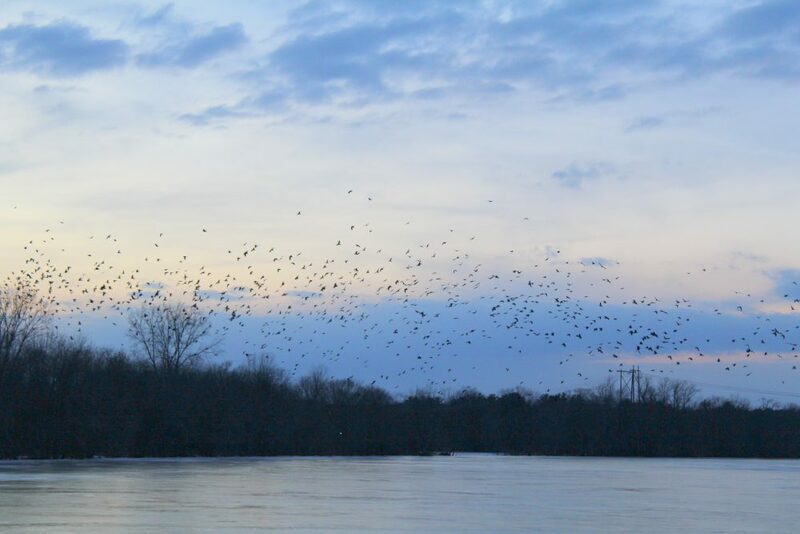 28, closer to the south side of the river; large swirls of Crows were seen streaming in from the upriver as darkness closed in…..WOW!! 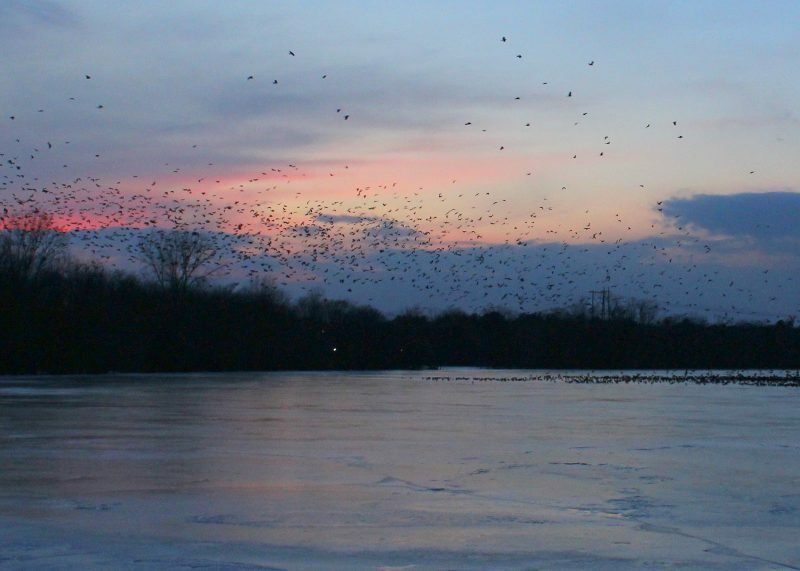 This was such a great birding experience. Many thanks to all the organizers for making this happen. 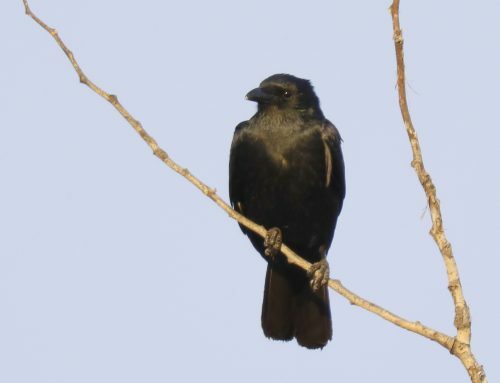 Special thanks to Craig Gibson who drove us around and told us about the crows and peregrines. WOW indeed! 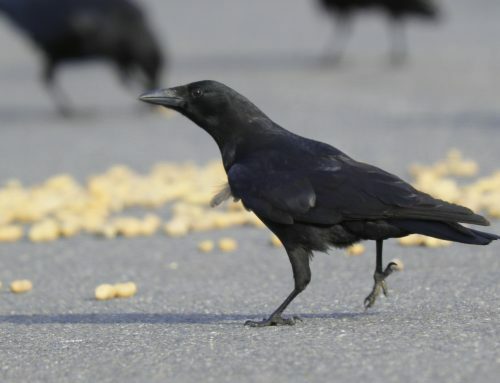 Great having you with us out on Crow Patrol….the WOW! continues each night out!! 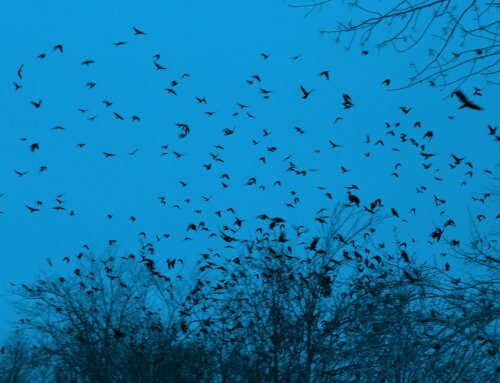 Writing from Middlebury, VT, on 2/5/19… Here crows are beginning to flock, but not in such numbers… thanks for sharing your wonderful pix and info! You are most welcome….please keep checking back!